This black and white corset is trimmed with a festive red. It ships from Canada, and is available in S, L and XXL sizes. Here's a similar damask corset with red trim. This black and white damask overbust corset has a bit of a steampunk feel to it, with the leather and the gold fastenings. I like the modern look of this larger print damask corset. This elegant damask corset is from White House Black Market. This damask corset is embellished with ruffles and bows. 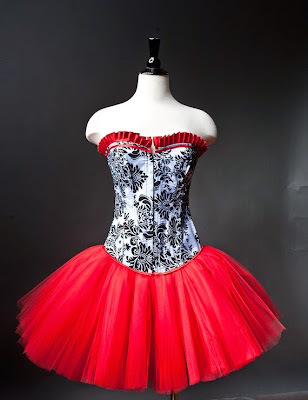 This damask corset is attached to a red tulle skirt. It's by Glamtastik on Etsy. Here's a black and white damask waist training corset, from Miss Talk on Amazon.